IMLA Executive Director Dr. Greg Wiles said of her recognition: "Dr. French has made an immediate impact on the middle schools in Caldwell. She took to the Caldwell School Board a plan for teachers to be able to team and work in PLC's by having an early release time once a week. I have seen first hand the two middle school principals in Caldwell and how they interact with Dr. French. There is a great sense of teamwork and respect. She believes in her admin team and the teachers." Two IMLA members nominated her for the award. One wrote: "Dr. Shalene French is in her third year leading Caldwell School District and she has done an amazing job. During her short time here, she has worked very hard to implement a culture where teachers work closely together honing their skills and developing top notch instruction to deliver to students. 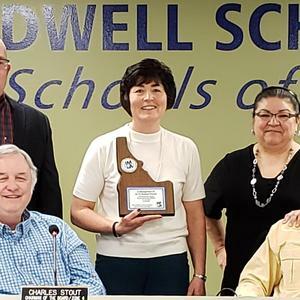 She is a champion for the kids of Caldwell. She is continually looking for ways that our district can offer opportunities for students to further their academic experience." Dr. French joined the district in the 2016-17 school year as superintendent after five year as the Director of Human Resources in the Bonneville School District. Prior to that she was a principal, assistant principal and math teacher and girls basketball and track coach at Rocky Mountain Middle School. IMLA celebrated its 30th anniversary at the conference, which as held in Caldwell. Attached is a photo of Dr. French being recognized by the Caldwell Board of Trustees at its March meeting.